This time the major travel online fair dedicated to all winter travel destinations will impress its participants with not only the most up-to-date information about upcoming season, but also with a renewed platform and interface. The winter OTM attendees can join the online presentations from all mobile devices, register with one click and share the broadcasts, using their social network profiles. 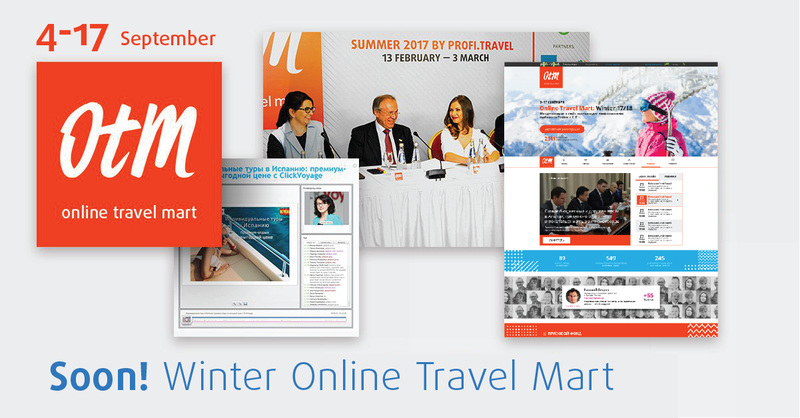 International fair ONLINE TRAVEL MART: WINTER 17/18 is the one and only professional online event of the upcoming tourist season devoted to the foreign destinations. During two weeks, from 4 till 17 September, at OTM platform for the wide audience of travel professionals from 11 Russian-speaking countries, will be presented all winter destinations and seasonal novelties — from Southeast Asia beaches to best skiing resorts of Europe. Even now the renewed interactive fair page is available for the future exponents and visitors. What services will be available for the attendees of ОТМ Winter 2017? Mobile version of the online fair page. This year the Profi.travel team have launched the website mobile version, which means that everyone can join the speakers presentations from all mobile devices at home, along the way, in a gym or traffic jam, wherever. For the first time ever users can tune into the current online presentations from the main page: earlier one should open the OTM schedule and choose the needed presentation. The new decision increases the audience of each and every online presentation of OTM. At the ordinary fair, exponents evaluate the interest to their event or booth due to the visitors number, but at OTM — due to the number of users who join the presentation online or watched its record. Interactive board of the fair attendees. Would like to know what do the visitors do at OTM in the mean time? Point to the user icon and know who of tourism market representatives at this very moment downloads a catalogue and who asks a question at a presentation. There are name, job title, city and region mentioned in the profile of every attendee, and also the personal number of points at Profi.Travel Loyalty program in this fair. This option makes the online event maximally dynamic and introduces the user to the colleagues from the travel industry. Prize fund — a great motivation for the attendees activity. For every action in the fair, the Profi.travel Loyalty participants receive points. The users who gained the maximum of points compete for the prize. Here the participating companies gather and represent all needed and detailed information about the tour product to the wide audience. Maximally user-friendly interface allows the OTM attendees to download catalogues and receive the relevant data about exponent during the fair and after its finish. This year everyone can register at the fair and joins its activities in one click through the social networks. Beyond that, the online fair integration with social networks helps the participants to share the presentation, a personal diploma or the speaker at their social net profile. The fair schedule also has a number of changes: more user-friendly registration system, an accent to the company name in the online presentation description and hidden past activities of the program. You can book the booth at ONLINE TRAVEL MART: Winter 2017/18 on the fair website — otm.profi.travel. We are looking forward to welcome everyone who offers the foreign tour product for the Russian-speaking markets and is interested in increasing of the tourist flow from Russia and the CIS in the winter season. We invite the national tourist offices, hotels and hotel chains, tour operators, DMCs, airlines, railway tickets distributors, car rental, medical and SPA centres and resorts.